It’s been speculated for months. Even casual fans are buzzing about it. The same guys who booed Goldberg and Lesnar out of the building at Wrestlemania over a decade ago, are now excited to see them inside the squared circle yet again. Brock Lesnar has been booked as an unstoppable monster since Wrestlemania 30 when he ended the streak. 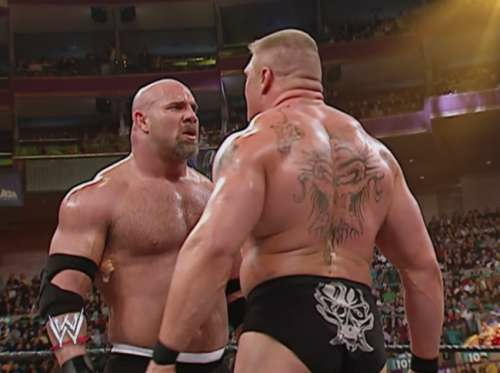 Even though he has been squashing every single opponent, we know this won’t happen when Bill Goldberg makes his big return because of the way he’s been booked all through his life. Which brings us to this article. Sure, Brock Lesnar is a major box office draw and a special attraction. But we honestly feel that right now, Bill Goldberg is a bigger star. Before you interject, let us explain our case. Here’s why we think Brock Lesnar is not as big a star as Bill Goldberg is!